Play on the world's longest golf course: Nullarbor links. Not satisfied with cricket matches that take five days to complete? There is now a golf course that takes four days and 1365km to play. Isn’t that typical of Australians? Not satisfied with Test cricket matches that can take five days to complete, we now have a golf course that takes four days to play. Stretching 1365km from Ceduna in South Australia to Kalgoorlie in the West, the Nullarbor Links is an ambitious project designed, as far as we can tell, to give travellers something interesting to do on that long and lonesome road so famously devoid of trees. The brainchild of Bob Bongiorno, former manager of the Balladonia Roadhouse on the Nullarbor, the 18-hole cross-country marvel is due for completion in mid ’09 and will consist of a series of holes at select towns and roadhouses along the Eyre Highway. Some of the holes already exist at working golf courses – at Ceduna, Eucla, Norseman, Kambalda and Kalgoorlie – and a small number are at disused courses that will be rejuvenated expressly for the project. The remaining holes will be built completely from scratch at select locations including Penong, Nundroo, Border Village, Mundrabilla, Cocklebiddy, Balladonia and Fraser Range. 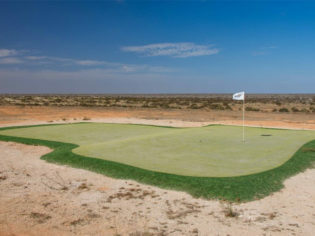 At these ultra-remote spots, the tees and greens will be synthetic grass, with everything in between made up of all-Australian, all-natural terrain (ie, mostly dirt, rocks and gravel). The course is also designed to give overseas visitors an unparalleled taste of the real Australia, with holes on working sheep stations, wheat farms and alongside gold mines. 1365km from Ceduna in SA to Kalgoorlie in WA, along the Eyre Highway.